Makenzie and Steven Schultz of Cedar Rapids, Iowa hired a babysitter Saturday night and headed to a new restaurant in town to celebrate their wedding anniversary. What happened next caught the attention of the world. Makenzie told CNNMoney that one couple actually walked out of the restaurant and another ran up to the hostess booth to warn a friend not to eat there. The scene was akin to something out of a bad reality TV show where the diners are duped. But the Schultzes looked around and realized something: There was only one waiter serving 12 tables, and he was doubling as the bartender too. Makenzie and Steven met when they were both waiters at the Bubba Gump Shrimp Co. in the Mall of America in Minnesota. They know that sometimes the kitchen messes up or someone calls in sick and it’s not the waiter’s fault, but guests still blame the server, often leaving horrible tips. 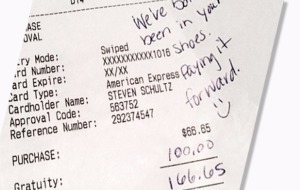 “Steven and I agreed it would feel good to make this guy’s night when he would probably be getting minimal to no tips due to slow service,” she wrote in the Facebook post that displayed the bill (but omitted the name of the restaurant). The tip worked out to 150%, a heck of a lot bigger than the usual 15% to 20% most Americans leave. CNNMoney confirmed the huge tip with the restaurant, which said they planned to add more waiters and that someone had called in sick Saturday and they couldn’t find a replacement. The Schultz family was astonished by how much attention the post received. They have heard from hundreds of people through Facebook, most complimenting them or sharing similarly inspiring stories. As of Monday morning, they had not heard anything more from the server or the restaurant. They left without saying anything to the waiter because he was busy and they wanted it to be a surprise.